It’s been sunny in the mornings here and rainy in the afternoons. I was worried that the rain would put a damper on their vacation, but they seem to enjoy the storms. Apparently in Anchorage it is cloudy and ‘rainy’, but the rain is like walking through fog. Today we had some periods of pretty impressive rain. (Not big Nebraska storms, but pretty dang splashy!) 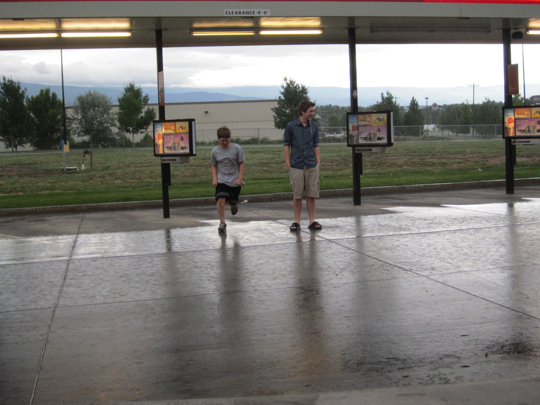 Charlie and Jacob went out to stand in it when we were at Sonic. 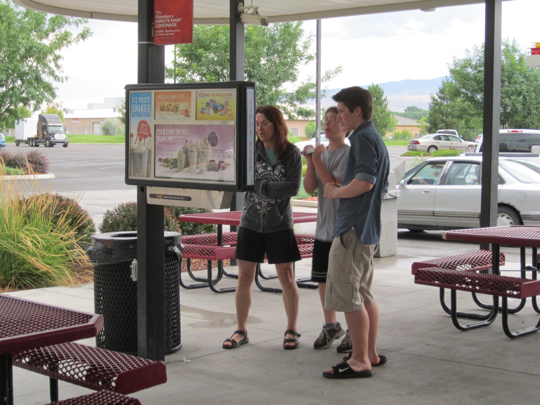 We absolutely had to stop at Sonic, since Jacob loves it so much. He would have ordered everything on the menu if he could. As it was, he put more ketchup on his food than I have ever seen before. I am not kidding – five packets on his hamburger, then he dipped each bite in more ketchup. I think he might have a tomato deficiency he’s trying to fix. I haven’t been to Sonic in years and years. My dad says the cherry-lime drink they make is very good.